A custom app could be installed on a target phone to extract information. In March 2011, Google remotely installed a program that cleaned up phones infected by malicious software. It is unclear if Android still allows this. Many applications use Android’s Backup API. The information that is backed up, and thereby accessible from the backup site directly, depends on which applications are installed on the phone. If the target data are stored on a removable SD card, it may be unencrypted. Only the most recent versions of Android allow the user to encrypt an entire removable SD card; not all apps encrypt data stored on an SD card. Some phones have fingerprint readers, which can be unlocked with an image of the phone owner’s fingerprint. Some people have modified their phones’ operating systems to give them “root” privileges – access to the device’s data beyond what is allowed during normal operations – and potentially weakening security. But if these options are not available, code-breaking is the remaining way in. In what is called a “brute force” attack, a phone can be unlocked by trying every possible encryption key (i.e., all character combinations possible) until the right one is reached and the device (or data) unlocks. A very abstract representation of the derivation of the encryption keys on Android. There are two types of brute-force attacks: offline and online. In some ways an offline attack is easier – by copying the data off the device and onto a more powerful computer, specialized software and other techniques can be used to try all different passcode combinations. But offline attacks can also be much harder, because they require either trying every single possible encryption key, or figuring out the user’s passcode and the device-specific key (the unique ID on Apple, and the hardware-bound key on newer versions of Android). To try every potential solution to a fairly standard 128-bit AES key means trying all 100 undecillion (1038) potential solutions – enough to take a supercomputer more than a billion billion years. Guessing the passcode could be relatively quick: for a six-digit PIN with only numbers, that’s just a million options. If letters and special symbols like “$” and “#” are allowed, there would be more options, but still only in the hundreds of billions. However, guessing the device-specific key would likely be just as hard as guessing the encryption key. That leaves the online attack, which happens directly on the phone. With the device-specific key readily available to the operating system, this reduces the task to the much smaller burden of trying only all potential passcodes. However, the phone itself can be configured to resist online attacks. For example, the phone can insert a time delay between a failed passcode guess and allowing another attempt, or even delete the data after a certain number of failed attempts. Apple’s iOS has both of these capabilities, automatically introducing increasingly long delays after each failure, and, at a user’s option, wiping the device after 10 passcode failures. What happens when one tries to crack into a locked Android phone? Different manufacturers set up their Android devices differently; Nexus phones run Google’s standard Android configuration. We used a Nexus 4 device running stock Android 5.1.1 and full disk encryption enabled. 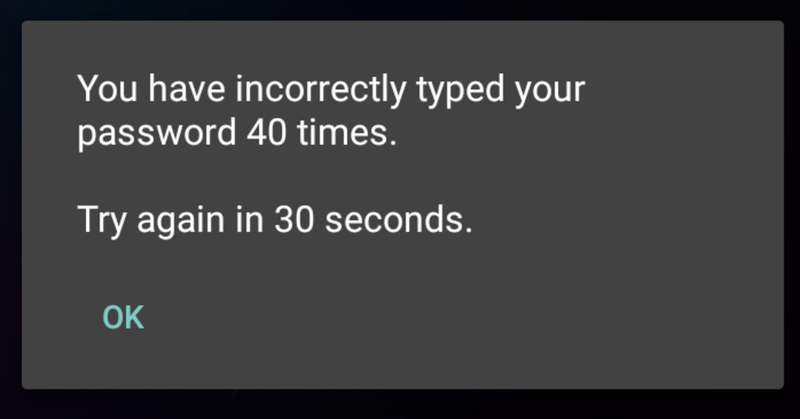 Android adds 30-second delays after every five failed attempts; snapshot of the 40th attempt. We started with a phone that was already running but had a locked screen. Android allows PINs, passwords and pattern-based locking, in which a user must connect a series of dots in the correct sequence to unlock the phone; we conducted this test with each type. We had manually assigned the actual passcode on the phone, but our unlocking attempts were randomly generated. These delays impose a significant time penalty on an attacker. Brute-forcing a six-digit PIN (one million combinations) could incur a worst-case delay of just more than 69 days. If the passcode were six characters, even using only lowercase letters, the worst-case delay would be more than 58 years. When we repeated the attack on a phone that had been turned off and was just starting up, we were asked to reboot the device after 10 failed attempts. After 20 failed attempts and two reboots, Android started a countdown of the failed attempts that would trigger a device wipe. We continued our attack, and at the 30th attempt – as warned on the screen and in the Android documentation – the device performed a “factory reset,” wiping all user data. Just one attempt remaining before the device wipes its data. In contrast to offline attacks, there is a difference between Android and iOS for online brute force attacks. In iOS, both the lock screen and boot process can wipe the user data after a fixed number of failed attempts, but only if the user explicitly enables this. In Android, the boot process always wipes the user data after a fixed number of failed attempts. However, our Nexus 4 device did not allow us to set a limit for lock screen failures. That said, both Android and iOS have options for remote management, which, if enabled, can wipe data after a certain number of failed attempts. The iPhone 5c in the San Bernardino case is owned by the employer of one of the shooters, and has mobile device management (MDM) software installed that lets the company track it and perform other functions on the phone by remote control. Such an MDM app is usually installed as a “Device Administrator” application on an Android phone, and set up using the “Apple Configurator” tool for iOS. Our test MDM successfully resets the password. Then, the scrypt key derivation function (KDF) is used to generate the new key encryption key (KEK). If an attacker needed help from a phone manufacturer or software company, Android presents a more diverse landscape. Generally, operating system software is signed with a digital code that proves it is genuine, and which the phone requires before actually installing it. Only the company with the correct digital code can create an update to the operating system software – which might include a “back door” or other entry point for an attacker who had secured the company’s assistance. For any iPhone, that’s Apple. But many companies build and sell Android phones. Google, the primary developer of the Android operating system, signs the updates for its flagship Nexus devices. Samsung signs for its devices. Cellular carriers (such as AT&T or Verizon) may also sign. And many users install a custom version of Android (such as Cyanogenmod). The company or companies that sign the software would be the ones the FBI needed to persuade – or compel – to write software allowing a way in. Overall, devices running the most recent versions of iOS and Android are comparably protected against offline attacks, when configured correctly by both the phone manufacturer and the end user. Older versions may be more vulnerable; one system could be cracked in less than 10 seconds. Additionally, configuration and software flaws by phone manufacturers may also compromise security of both Android and iOS devices. But we found differences for online attacks, based on user and remote management configuration: Android has a more secure default for online attacks at start-up, but our Nexus 4 did not allow the user to set a maximum number of failed attempts from the lock screen (other devices may vary). Devices running iOS have both of these capabilities, but a user must enable them manually in advance. Android security may also be weakened by remote control software, depending on the software used. Though the FBI was unable to gain access to the iPhone 5c by resetting the password this way, we were successful with a similar attack on our Android device.